Since our last “Free One-Month PR Giveaway” was so successful, it’s time to do it again! Just like our first Facebook Giveaway, all you have to do is “like” our giveaway announcement on our facebook page and you’ll be entered into the random drawing. We will stop accepting entries next Wednesday, August 4th! To relieve the ‘hump day’ syndrome, we’re inviting you to join us for a “Where’s Deasy?” event in SocioTown next Wednesday July 7th. Staff member Deasy will be hiding somewhere in SocioTown and the first person to find her will recieve a “BLANK HERE”. There will be a clue posted on the blog prior to the event. “Where’s Deasy?” starts at 2 pm SocioTown time! To Socians from United States, happy 4th of July (a.k.a Independence Day)! For this particular celebration, we’ve released and re-released patriotic red, white, and blue items into the stores for you guys! 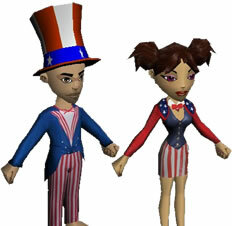 This includes the new Uncle Sam outfit for the guys and the starry dress for the gals. These seasonal items will only be available for a very short period of time, and won’t be available again until next year’s 4th of July! Be sure to get your hands on them before it’s too late! ALSO!- the Disco Ball room in the Event Dome will open at 3pm SocioTown time for you guys to party at. Drop by! 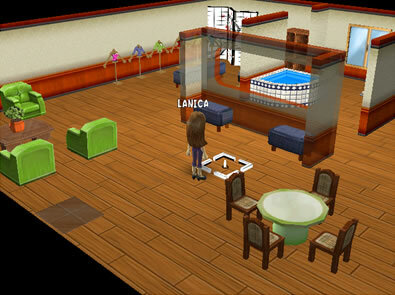 Socian Lanica was brave enough to nominate herself for the Room of the Week spotlight, and it’s quite darling. The layout of this room reminds me of a hotel room fused with the dressing room of a high-class clothing store with the bed completely exposed on one side and a set of clothes complete with a stool chair and curtains. My favorite part is the see-through wall to the jacuzzi. Thanks for sending your nomination in, Lanica!